We started with a 1989 Castello di Ama. It had an elegant brilliant red color with a brownish rim revealing its advanced age. The nose started on a fine vanilla touch and red fruits, quite harmonious, and then developed into earthy notes with underwoods scents. On the palate it was quite round, but also with a “round” (overall) acidity (or should I call it slight sourness). It still had some fire, but also slight traces of astringency and a little bitterness in the finish which was rather medium long. All in all nice to drink still, was nice to see how it developed in the glass, gaining a little complexity, but then again it didn’t reach for the stars. 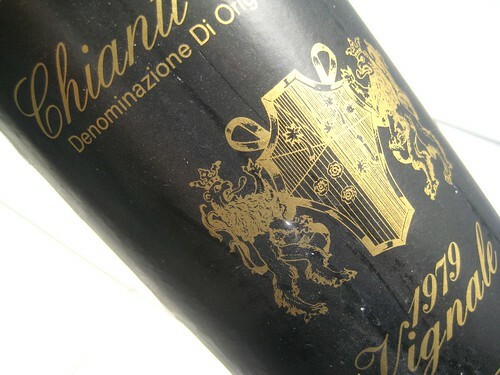 Second was a 1979 Vignale from Chianti. The color was more brownish, reminding Cognac, but of course a little more red. It was still brilliant and shiny though. The nose couldn’t hide its age, more than 20 years were evident here. Madeira, sweet earthiness, a slight cellar smell, a particular fruit wasn’t identifiable. On the palate the wine was much more pleasant, the sweetness came through, mixed with a little fruit, medium-weighted and balanced with no astringency at all, with a rather long and harmonious finish. Compared to the first wine this one deteriorated with time and got more and more blunt. 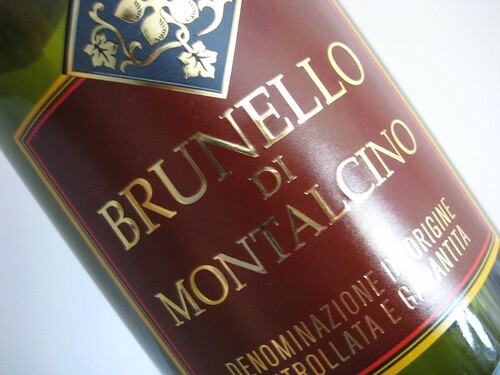 Next we had a 2002 Brunello Di Montalcino by Pi.Gi.Vi. This had an ink-dark color with purple reflections. The nose was intensive of fruit, showing blackcurrant and cherries. On the palate then came juicy fruit, cherries, some herbs, and a hint of sweetness that sometimes felt a little like Marzipan. Clearly a much much younger wine. It still had quit some astringency in the finish which was medium long, and also a slight bitterness, but was all in all a nice wine and for Many the wine of the evening actually. It still has some potential for development I guess. 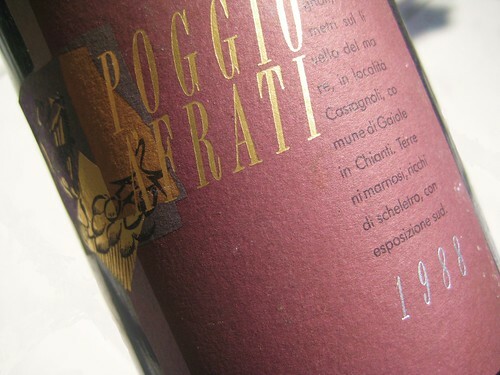 Number 4 was a 1988 Pogio Afrati Rocca di Castagnoli. It was medium-dark in color, red but with a slight brown hue. The nose developed cherry scents of great finesse, after some opening time some underwood tones also appeared reminding a bit old Baroli. The palate developed dark fruits but also revealed slight spice notes. 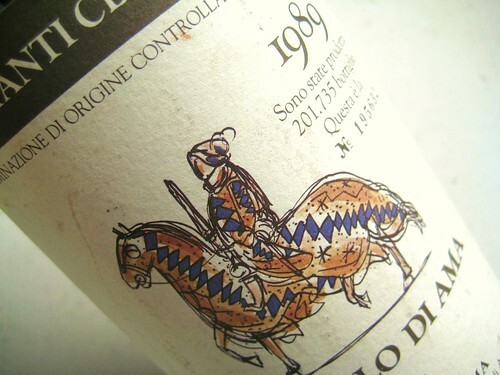 It was harmonious and balanced, and yet it had certain elements that stepped forward from time to time: sometimes you’d realize a little astringency giving some more grip, then suddenly a more generous acidity, sometimes also a slight sweetness. The wine was a player that had several small developments in the glass. The finish then was medium long and harmonious. One of my favourites. 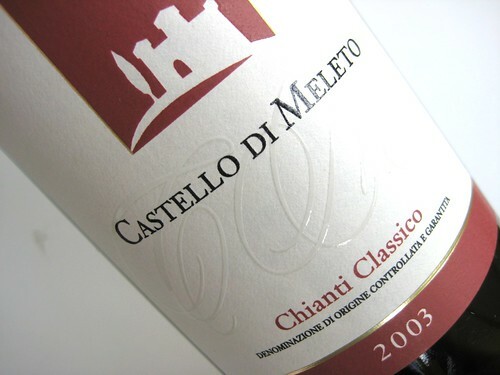 Number 5, a 2003 Chianti Classico by Castello di Meleto, had cork. Damn! 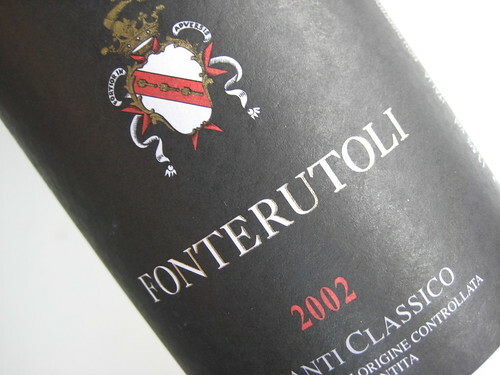 Thankfully the following wine, a 2002 Chianti Classico by Castello di Fonterutoli didn’t have cork. It had a very dark color, nearly black with a purple hue. The nose was slightly ethylic, reminding liquor scents, but rather closed when it came to fruit. On the palate the wine started with a touch of sweetness coming from the alcohol of course, but then astringency strikes. It isn’t unbearably strong, but much stronger than in previous bottles and reveals that the wine isn’t ready for enjoyment yet. The finish is medium long. Maybe this is a long runner going through a closed phase, but the diffuse appearance calls for some pessimism. 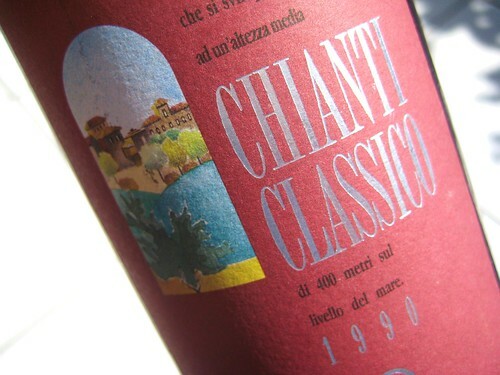 A 1990 Chianti Classico by Castagnelli was our N°7, but it didn’t meet our expectations. Its colour had a tendency towards brown; its nose had an undeniable age tone. On the palate, there was some fruit left, but not much more. It was drinkable, but without real pleasure. Ok this was it for Tuscany. So which was the wine of the evening? I heard many voices saying number 3 was their favorite, it was a young and full bodied wine with nice fruit, and clearly sexier than those old guys from the 70s and 80s. Personally I liked it too, but I appreciated also the first 2, especially how they developed in opposite directions in the glass, the first one starting weak and building up, the second starting strong, and deteriorating with time. But I think number 4 had most of my sympathies, such an elegant nose, round, harmonious with a little complexity despite its 20 years.